Fall is officially here and I’m starting to see pumpkins, pumpkins everywhere! 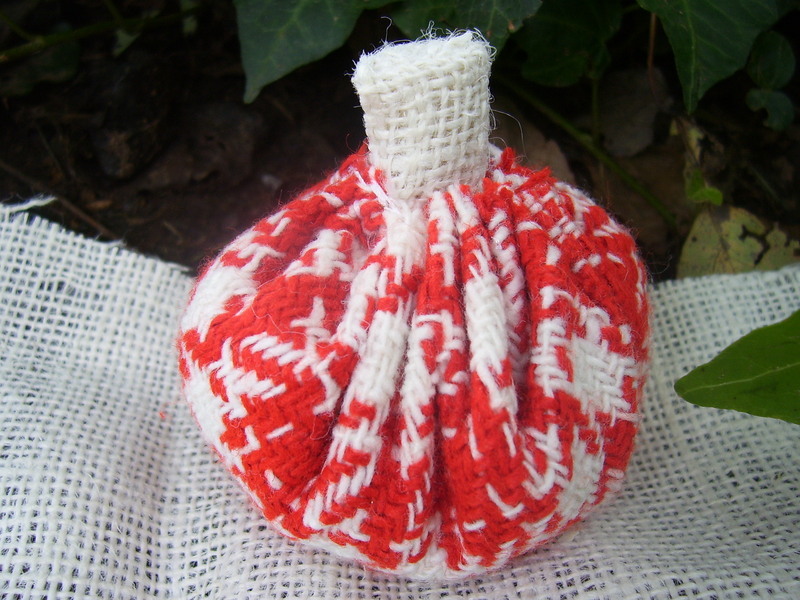 Today I’m going to show you how to make some easy-peasy fabric pumpkins. For me, the beauty of using fabric (besides the fact that I just plain love it) is that it comes in such a variety of colors, patterns, and textures. 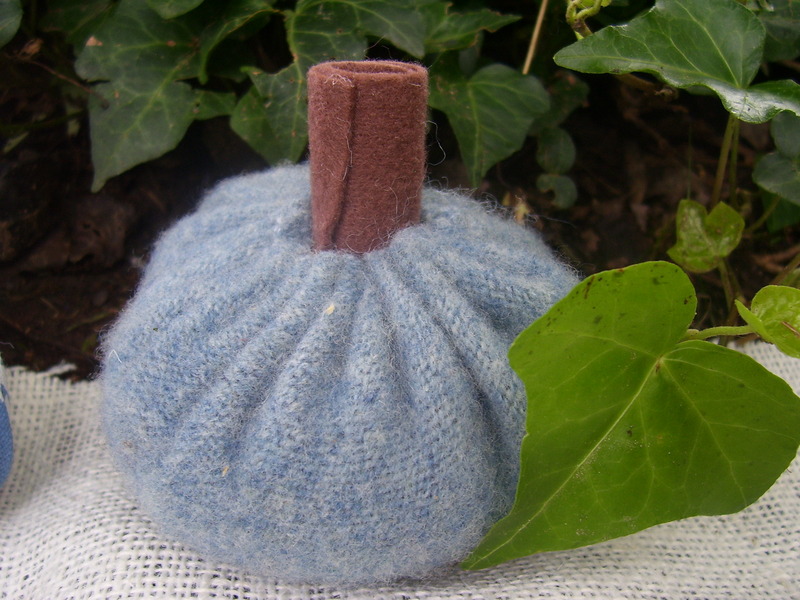 This is also a great project to use upcycled pieces, like the sweater I used to make the blue pumpkin shown here. My little line-up of fabric pumpkins. Choose the fabric you want to use. Just about any kind will work for this project! Check out this fabric I found at a thrift store. 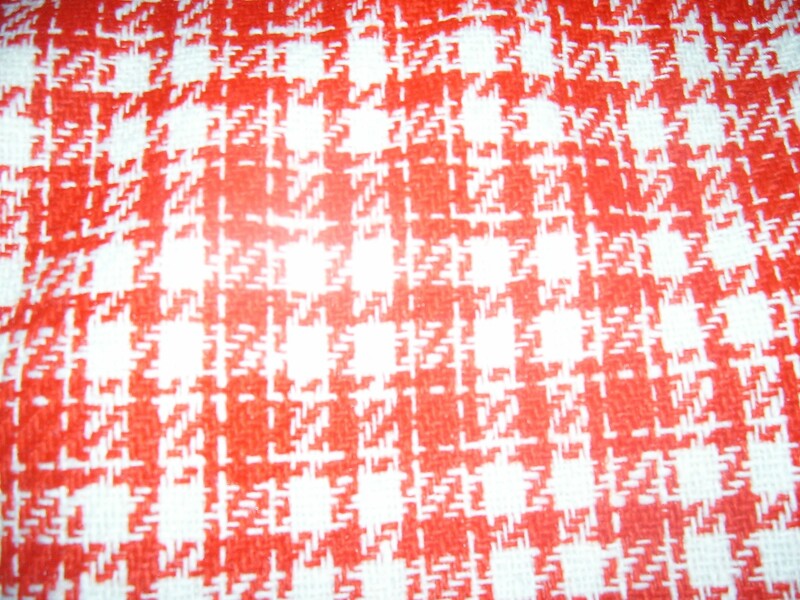 I got @2 yards for something like $2! I just used some to make something for a friend and I thought it would make a sharp looking pumpkin. 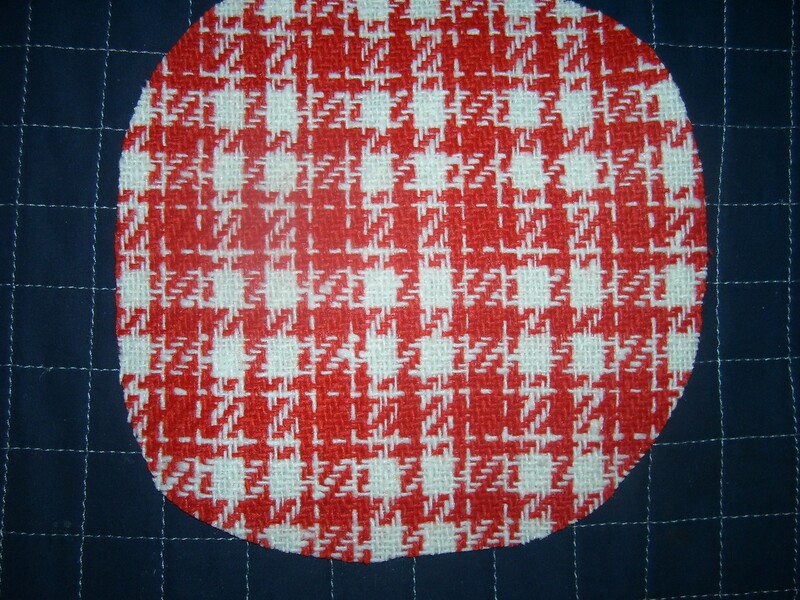 Cut your fabric into a circle--pretty much any size will do. 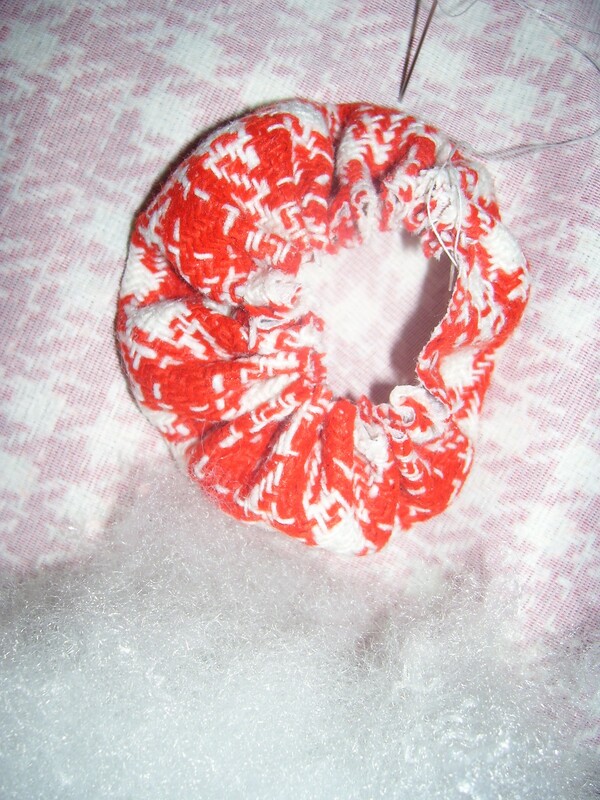 Using needle and thread, sew a basting stitch around the perimeter of your circle. Pull slightly on it as you go--notice how mine is starting to gather. Go the whole way around, leaving an opening at the top. Don't snip that thread yet! 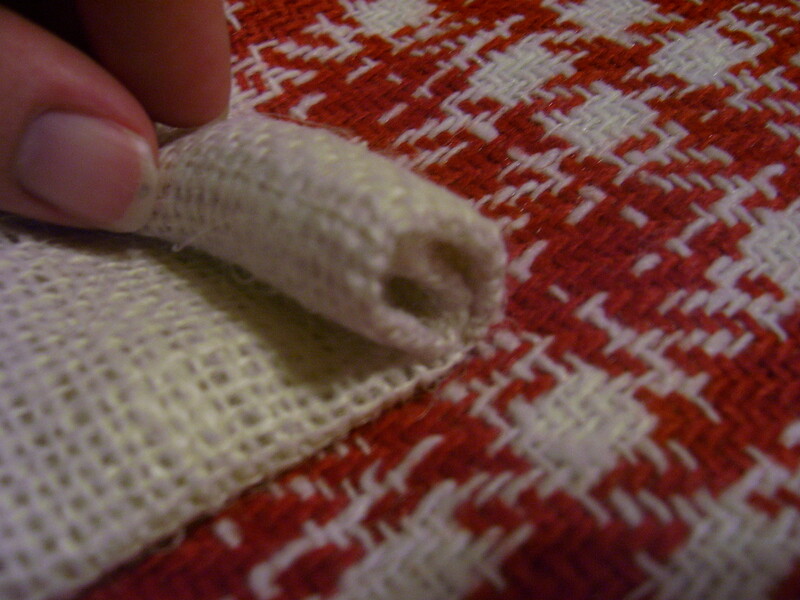 Take a strip of burlap (or felt), fold in half lengthwise, and proceed to roll up a bit. This will be your stem, so you can decide how thick you want it to be. Use hot glue to hold together. 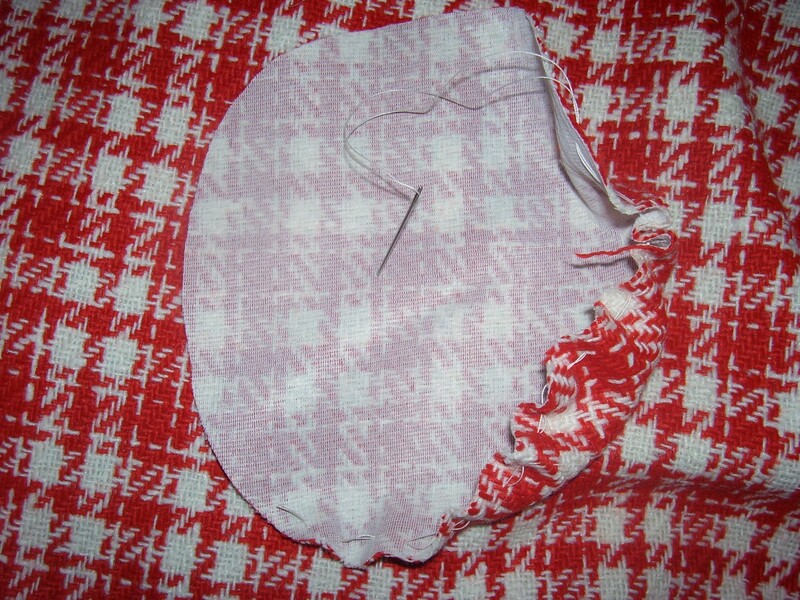 After this step, stuff gathered fabric with polyfil or fabric scraps. Hot glue around base of stem, insert into the opening of the pumpkin, and pull thread taut. At this point I made a couple of tiny stitches to hold into place as well, then was able to snip my thread. One made from upcycled sweater material. 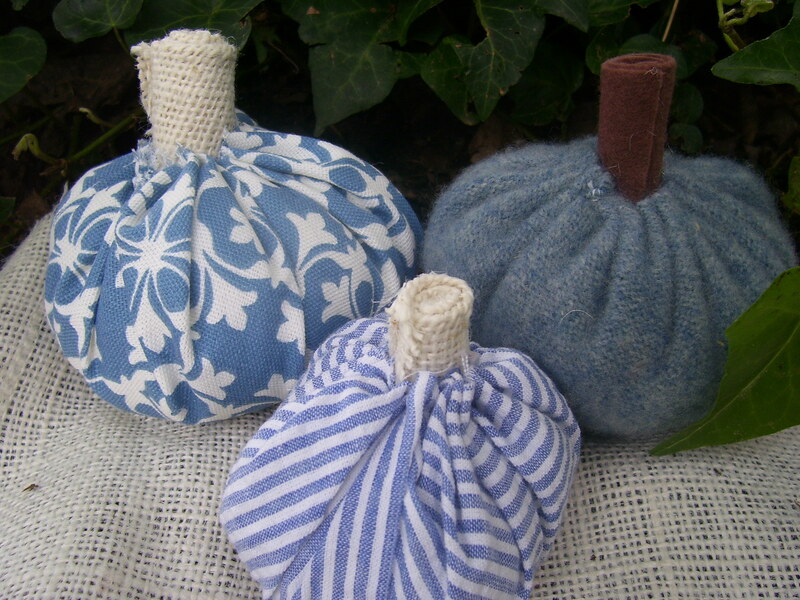 A trio of blue pumpkins. Love the pumpkins! You have a blog award from me 🙂 Here is the post http://ejoym.blogspot.com/2011/09/blog-award.html Have a good week! Thank you sweet friend! I still want you to do a guest post sometime–maybe something fallish using your paper crafting genius. Oh, and congrats to you, I saw your wreath featured somewhere yesterday. I just saw you on Gluesticks and wanted to peek at your cute pumpkins. Great job and I love the blue. Cute, cute, cute! 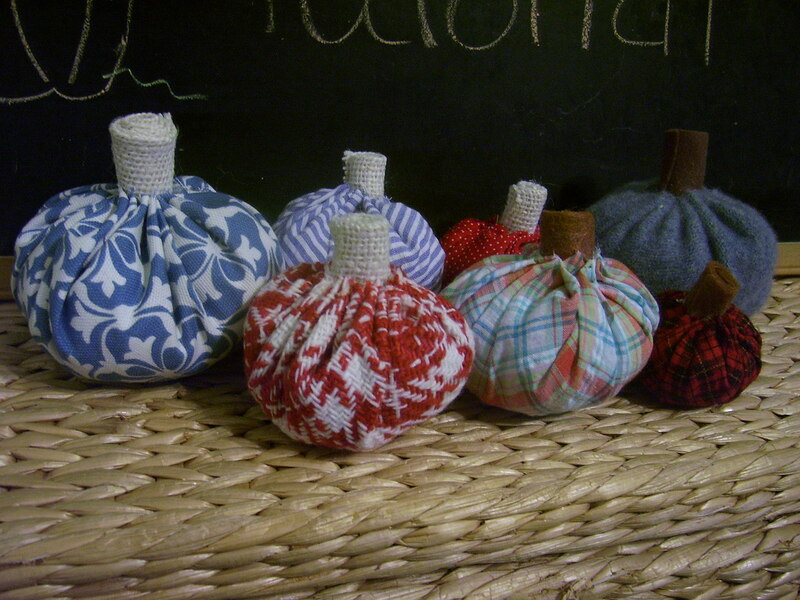 Thanks for showing how to make those fabric pumpkins. I saw your post over at “Bear Rabbit Bear”. Cute! I love thrift store fabric!! Thanks for linking to Things I’ve Done Thursday! 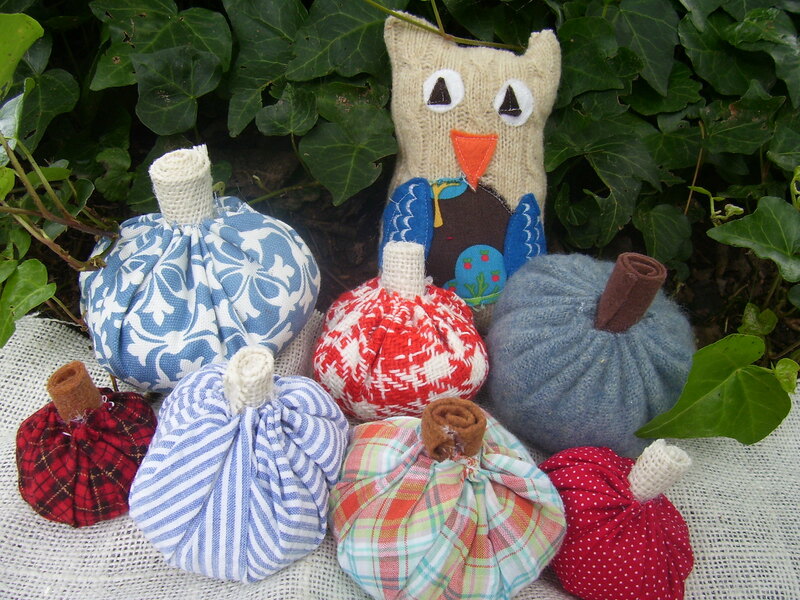 These fabric pumpkins are so adorable! Thanks for joining last week’s What’s In The Gunny Sack? link party and I hope to see you again for tomorrow’s party! These are so adorable. I love the fabric that you chose! Thanks for sharing this @ Show & Share! Love how it turned out! Thanks so much for linking up with us at Show & Share! Hope you’re joining us again this week!